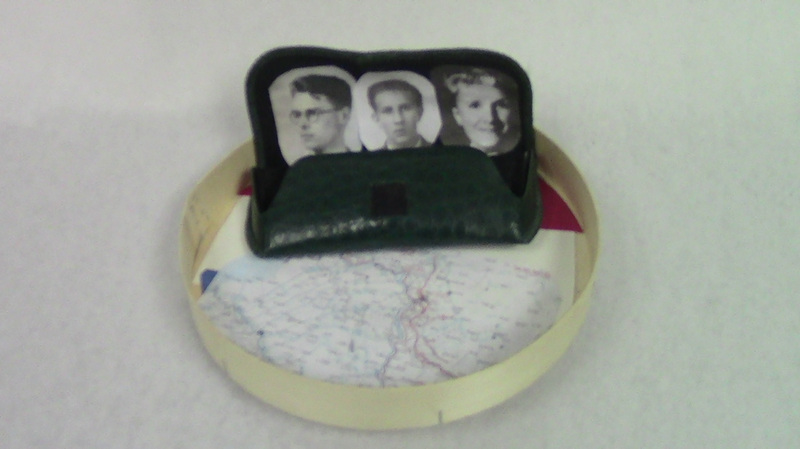 This shadowbox represents a man named Gideon Boissevain and his family. The background is a Netherlands flag because he is from the Netherlands. There is also a map of Amsterdam because that is where he worked to help the Jews and to fight against the Nazis. The glasses case represents the fact that he always wore a pair of glasses. Inside the case, he has pictures of his family. It wasn’t just Gideon who helped make a difference in The Holocaust, his family members did as well, and they deserve recognition. Gideon Boissevain was born on June 5, 1921 in Amsterdam, Netherlands. His parents were descendants of the Huguenots (French Protestants). All his friends called him “Gi.” Gideon also had two brothers and two sisters. His father worked in the insurance business. Janka was one of his sisters. Gideon had a cousin named Louis. His mother’s name was Adrienne Boissevain. She was one of the main leaders of the French resistance groups against the Nazis. Even though his life was short, he made a huge contribution to Nazi resistance. Unfortunately, there are no known documents about the others in Gideon’s family. The names of Gideon’s brothers and his other sister are unknown, as well as the jobs these people had. At first, in the late 1930’s, Gideon and his family joined the Dutch Nazi Party. Originally, it appeared to them that the Dutch Nazis would offer a good and well managed political system. After they realized the party wasn’t what they thought it was, they quickly left the party. In 1938, Gideon completed a course to become an actuary. Gideon worked for an insurance company from 1938 to 1940. He worked alongside his father for most of his time in that company. On May 10th of 1940, the Nazis invaded Amsterdam and the Netherlands. Gideon and the rest of his family worked in a Dutch resistance group. Together, they worked to hide Jews and start anti-Nazi riots. He and his family helped to disguise Jews. They would also give the Jews places to hide and provide them false identities. On August 2nd of 1942, Gideon and his whole family including his parents, two brothers and two sisters, were arrested for aiding Jews. On October 1st of 1942, they were all executed, along with around twenty other resistance fighters. Gideon’s mother was the only person that survived; she managed to escape three separate gas chambers. She was also able to escape multiple trucks carrying Jews to different concentration camps. In late 1945, a Swedish rescue team traveled to Germany in hopes of finding survivors. The team found Gideon’s mother; she was only 72 pounds when she was found. Sadly, Gideon was twenty years old when he died. Even though Gideon and most of his family died early in the Holocaust and weren't around for some of what happened, they still made an impact on resistance against the Nazi party. Unlike most, these brave men and women weren’t scared to stand up against the Nazis.